While most books on biblical rhetoric focus primarily on the epistles, this volume from prominent scholar C. Clifton Black considers the variety of rhetorical critical approaches now being applied to the Gospels (including Luke-Acts). This updated edition takes into account recent research since the first volume was published in 2001 and features two brand new chapters. 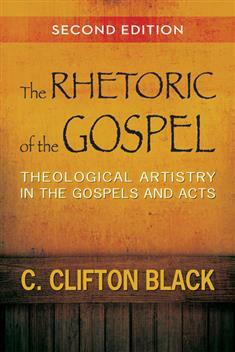 Black provides an overview of the different forms of rhetorical criticism, with examples from the Gospel of John; studies of characterization in Matthew and Luke; an analysis of classical rhetorical criteria found in Mark and Luke-Acts; and an analysis of the rhetoric of the parables with implications for contemporary preaching. "Is it possible for a volume on ancient rhetoric and the gospel to be scholarly, wise, pertinent, and witty all at once? When it's in the hands of Clifton Black, the answer is clearly yes. This welcome revised and expanded edition of Black's excellent Rhetoric of the Gospel is a magnificent resource for the student and the preacher alike. The chapter where Black brings the old lawyer and rhetorician Quintilian into the homiletics classroom, just to name but one of many delicious morsels in this volume, crackles with intellectual electricity, humor, and insight." "Professor Black is a conscientious reader, a judicious scholar, and a gifted writer; and this methodologically sophisticated and well-informed collection of his essays on the gospels and Acts has much to teach all of us. This is rhetorical criticism at its finest." "Clifton Black has spent his academic life loving scripture. In this book Black marvels as the creative artistry of these early Christian preachers who produced literature that changed the world. Something about the truth of Jesus Christ called for an unprecedented outburst of literary artistry. We could have no better guide through the art that is scripture than Clifton Black." "Here is a book for all who appreciate the power of language. Written for those charged to communicate the faith of the New Testament witnesses, it is also to be commended to those who may be suspicious of either rhetoric or the Bible. With understated grace, Clifton Black's updated 2001 collection of essays instructs and charms, and embodies what it is getting at." "This book is a delight. Clifton Black shares his unique capacities for wit and clarity in coherent theological appreciations of New Testament narratives, read through the eyes of classical rhetoric. His final chapters on preaching may shock—and educate." "Black explores the rhetoric of the New Testament in an original and insightful way. He does not limit his treatment to the standard handbooks nor does he confine his insights to the most obvious places in the New Testament. He guides readers through a wide range of ancient theory—including the Characters of Theophrastus and Longinus' On the Sublime—and shows their relevance in unexpected places, such as the Lukan parables, the last supper discourses of the Fourth Gospel, and a mysterious narrative in Acts. With an eye to his audience, he finally focuses on the parabolic rhetoric appropriate to preaching, using the ancient masters Augustine and Quintillian. Any Christian orator, a.k.a. preacher, will find this work enormously helpful."